I’m glad I did this. Meeting people who are experiencing the downside of wind power has taught me some important points which will help me direct my enthusiasm for wind energy in future. What I did for my time in Clear Creek was in fact a respected form of research. I did not ask a large group of people the same questions and then crunch the numbers representing their answers. Nor was I a participant-observer, because I did not keep track of what I learned while simultaneously living as the local residents do. I’m not employed in Norfolk County, nor was I living there as, for example, a stay-at-home parent or a retiree. I didn’t shop locally – my hostess cooked up a storm every day. What I did was qualitative, contextual research. Here are some highlights of what I learned. Local control and local benefit are missing. The Clear Creek residents I met explained that a multinational corporation owns the turbines, which are controlled remotely in the U.S.; 75% of the profits leave Canada. A believer in local community resiliency, I find this tough to take. And in this context, it would be interesting to know the nature and extent of any Canadian federal, provincial and/or local subsidies and/or grants that have been provided, and to whom. People’s lives have been changed in a number of ways. Just one example: the immediate area has long been known as a route for migratory birds. Sometimes, huge numbers have settled briefly on the cropped corn stubble, picking over kernels left behind. Now, residents who say watching the birds fly over had long been a personal pleasure report that they see birds approach overhead, then turn back to fly elsewhere. Area residents have formed a group, Norfolk Victims of Industrial Wind Turbines; members communicate with Wind Concerns Ontario, which connects similar groups in other areas of the province. Some area residents don’t participate because they approve of the turbines, or have no opinion, as they feel no ill effects personally. Others refuse to participate even though, privately, they cite negative experiences since the turbines began rotating a year ago, in November, 2008. These ill effects include headaches, dizziness (in some cases leading to falling), impaired hearing, a feeling of stuffy ears and/or pressure, sleep disturbances, feeling tired, and difficulty concentrating and maintaining one’s train of thought. How did I feel? I slept wonderfully, never felt dizzy. Forthcoming residents noted that their problems did not develop immediately after the turbines were turned on last year, and that it took each of them a while to wonder whether the turbines might be causing their problems. We all realized that the day mid-week when the turbines were still, because there wasn’t any noticeable wind, meant whatever I might be experiencing would be perforce less cumulative. For some of yesterday, I had a headache. That highlighted the research challenge. Was it a low pressure weather system? Or was I a little carsick? Might I be reacting to a visit to a neighbour who lives in a lovely hollow, where the turbine effect is said to be different? Or had the low-frequency vibrations started affecting me? Without proper measurement and recording, we can’t know the answer. Some research has been done. Careful, thorough research on specific concerns that have developed in areas with industrial turbines installed is needed, and designing reliable studies that will be useful in making public policy decisions will not be easy. One particular challenge, one that public policy-makers don’t often deal with well, is evaluating and coping fairly and responsibly with unintended consequences. We were all up plenty close and personal with these behemoths. Someone asked me if I’d touched one. That had never occurred to me. On the way home, I got out of the car and did so, noticing that I heard the rhythmic whooshing everywhere nearby, but not directly under the turning blades. Through my hand on the column, I definitely felt small, rapid vibrations, not at all the same speed as the blades. Finally, just one of my hostess’s delicious recipes: mix plain yogurt with cut-up seasonal fruit (unpeeled apples and pears, halved fresh mandarin orange sections, banana chunks); top with large-flake oats and dried cranberries. Day 5:Wind Turbine Week for Ellen-Danger in Distraction? One neighbour chats with every new acquaintance for a bit, then asks if he might request co-operation in talking about the turbines. Like most people he meets, I agree. He then continues to chat, while swinging his forearm around in a slow, regular circle, not very close to me, not directly in front of my face, but definitely in view. He keeps doing it, doing it, doing it… He farms a large number of acres hereabouts, notes he finds operating a combine under this repetitive shadow distracting. Seems to me it could be downright dangerous. He doesn’t fancy the shadow when it crosses his kitchen table, either. I wondered about that, given the height of a turbine in relation to its setback. Then I realized that in our part of the world, the sun is rarely overhead, so a turbine’s shadow can be much longer than its height. Details like these are best learned on the spot – I’m glad I’m here. Today, my hostess had tasks in town. When she’s been here, she’s driven me around the area, past each and every turbine, and has hosted neighbours who’ve also shared their experiences and views. I’ve welcomed her generosity, and all the information; today, I’ve had the chance for a little mid-week reflection and assessment. By myself, when it’s quiet, I can hear the turbines. I hear a regular, rather high-pitched, very quiet clanking. I checked its rhythm with the pace of the rotating blades I can see; they match. And the rhythm I hear is not the same as the rhythm of the kitchen fan I see rotating above the fireplace. Yesterday, many of the turbines were still, as there was little or no wind. Today, I woke to rain; then the sun came out. Next, it clouded over, then hard rain and wind developed, lasted briefly – I can’t hear the turbines through that. The turbines are still spinning slowly; I understand there’s a fixed maximum, no matter how strong the winds. Conversation, TV, kitchen activity, all drown out the turbine rhythm for me. I can’t hear the turbines when the fridge motor is running, or when it’s sunny and windy outdoors and I’m inside. The only noise here I ever find annoying is the electronic peeping that indicates someone’s in the garage. My personal sound perception, I want to emphasize, in no way negates the possibility of low-frequency vibration, of great concern to some – not all – the people in this area. There are not very many homeowners who live around here. Some of the farmers live elsewhere, and some of the farm workers are not permanent residents, and live in trailers. There are also people in various other professions, and some retirees. Anyone who hosts a turbine receives rental payment for the land it’s on. Of those being paid, most are either content to stay or are able to rent out their land. I’m told that in Europe, those paid include anyone who can see a turbine from home. Those who believe they are suffering negative effects acknowledge these aren’t universal; payment to all in view of any turbines would mean a better market for those who feel the need to move. Now, everyone here is, to one extent or another, trapped. That the turbines are automated, with final control wired to a California location, exacerbates concerns. People here feel response to any specifics – e.g. a single squeaky turbine – is slow-to-nonexistent. There are now many turbines along and near the Lake Erie shore. It took a number of years for the Erie Shores Wind Farm, the turbines I’m now near, to get going. 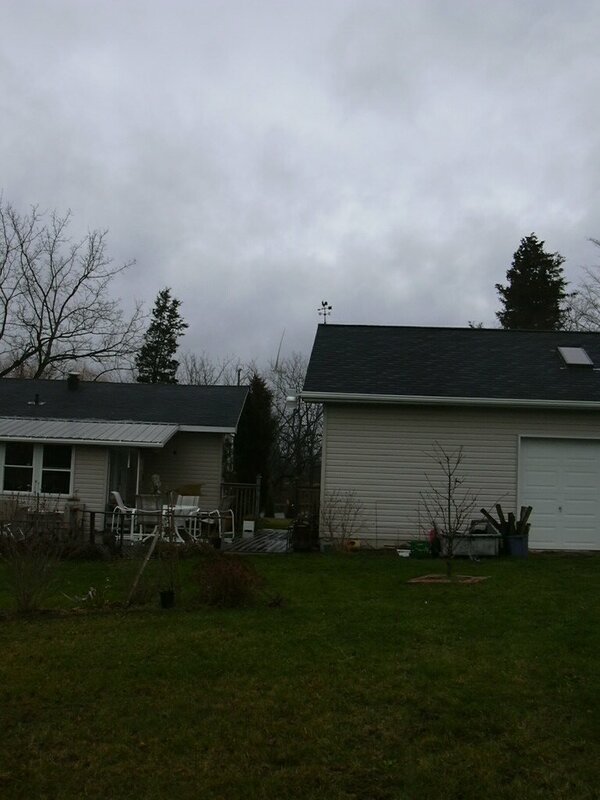 At http://www.erieshores.ca are some details about the history, government policies, and installation. AIM PowerGen Corporation has erected 18 Vestas turbines in the groupings called Clear Creek, Cultus, and Frogmore, (6 turbines each) around Clear Creek and in the immediate area north and east of it, and 20 General Electric/General Electric Canada turbines from Jacksonburg, just west of Clear Creek, to Elgin County Road 55, a stretch of about ten kilometres. AIM has since been acquired by International Power plc; their Canadian website is ‘under construction’. At first, the turbine plans were greeted with favour around here, if not total enthusiasm. As one who thinks they’re graceful, and finds watching their gentle spinning induces meditative relaxation, I can nonetheless understand how others might find them a visually-polluting blight. It’s personal – I think cellular telephone towers are hideously ugly, and attempts to mask them (I’ve seen a flagpole! and an impossibly enormous plastic pine tree!) hilarious. The turbines have been rotating here for about 18 months. Now, those who have perceived and reported ill effects feel ignored, abandoned, of little consequence. They are very upset. Some cite hearing loss, and constant exhaustion and difficulty concentrating, and/or various sorts of pain and discomfort. As well, people here point to two suicides, and a recent miscarriage at four months. That it is impossible to know whether any of this is in fact turbine-caused is perhaps the point. We don’t know precisely because nobody has made the effort to find out. Those who feel affected cite research elsewhere which supports their concerns, but those in any position to address these concerns are not responding. The ethical importance of respecting and addressing individuals’ concerns should not require reminders. One direct cause of the problem may be the funding structure for the turbines. Evidently, only 25% of the profit stream is staying in Canada. Who set things up like that? It would seem to be a terrible precedent not only for Canadian energy independence but also for local sustainability. People here describe themselves as having a culture of not complaining, feel they’re only opening their mouths now because they’ve been pushed hard. They believe in democracy, and saying one’s piece. There is a time when challenging is crucial. We cannot solve our energy problems either by rejecting wind out-of-hand, or by riding roughshod over anyone who seems to perceive ill effects from the technology. Local control would help. In some places in Europe, I’m told, one or more turbines that e.g. affect sleep, or are noisier when the wind comes from a particular direction, can be shut off for a period by those closest. Keeping profits at home would seem axiomatic. More careful positioning would make a difference. The ones here were erected before the Ontario Green Energy Act’s 550-metre setback was initiated; some are closer. 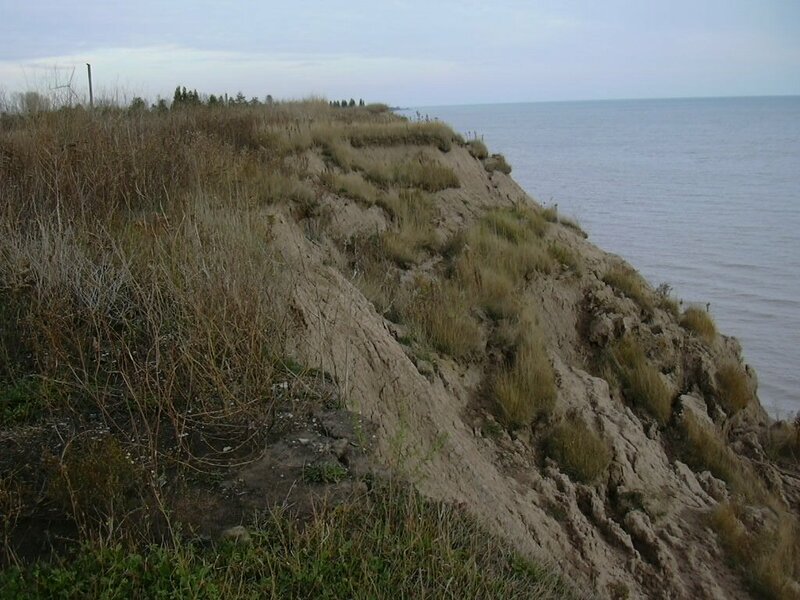 One is in fact sufficiently close to Lake Erie that the rapid shore erosion may threaten it within a few years. People here advocate relating setback to the number and size of turbines in an area. It is felt here that the western group of turbines was sited more kindly than the eastern group. This is not at all evident from the map showing 30 in the western area, of which 20 have been erected; on-the-ground details make a difference. Locating a group of turbines may well be no small challenge in our landscape, with farmhouses spaced widely, each on its own land, rather than grouped in settlements, as in some farming areas in other countries. Some research has already given useful results, more would be welcome, but waiting for the perfect study that will give us all the info we need is fruitless. We already know that the longer the power lines from source to use, the more power is lost, which means we need generation as close to end users as possible. One solution proposed for separating people and turbines, yet having them close enough to avoid too much transmission-line loss, is offshore turbines. People here wonder about research on long-term effects on water life, such as fish. Another issue is size: the turbines I’m now near are newer and larger than many that have been relied on for years: is there a healthy maximum we’ve exceeded? And developing any and all sorts of responsible grid improvement methods would be welcome. Meanwhile, perhaps the beneficiaries of the power being generated here can consider some sort of no-fault, one-time-only compensation to the local residents who are suffering. The precautionary principle is an appropriate basis. One possibility is payment; another is support for research into mitigation methods. Consensus-building would result in a mutually-agreeable plan. This would set a responsible example, demonstrating how the needs of all of us for clean energy cannot be met at the expense of ill effects for some of us. In favour of settlement of some kind – that so few are negatively affected means the negotiation procedure would be unlikely to be onerous, and the cost would be relatively small. And it would set a worthy precedent for the need to factor adverse effects into cost estimates for future projects. All of this needs to be in an energy efficiency context. All environmentally-responsible energy sources need to be utilized. 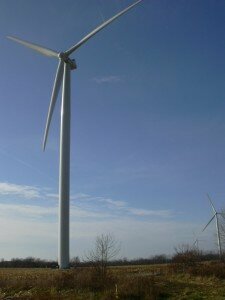 I’ve learned about an initiative the Norfolk Victims of Industrial Wind Turbines recommend. Solar film on rooftops, I’m told, has an enviable performance record in places both more and less sunny than here; installing it would mean green jobs and long-term benefits. And here’s the last concern I’ll broach for today. Some of those objecting to wind power say they’d rather live near a nuclear power plant. They are willing to trade the possibility of a life-ending nuclear accident for the certainty they feel of ongoing health damage. These people believe many wind power opponents become perforce nuclear power supporters. Pitting supporters of one energy source against those for another is not the way to address our need for clean energy. I’ll be clear: I myself oppose nuclear power. In my view, the fiduciary irresponsibility government after government has shown is reason enough to fear taking that path once again. And people who point out that the wind doesn’t always blow, the sun doesn’t always shine, don’t seem to be aware of management possibilities, and don’t remember that other energy sources have proven less than reliable. Because nuclear power has set a precedent of irresponsibility doesn’t mean we should perpetuate and expand our irresposibility to other energy sources. We can develop wind power productively and respectfully. Let’s. At the end of the corn field behind the house where I'm staying, the shore of Lake Erie is rapidly eroding. Today’s revelation: this morning, we drove around in my hostess’ Smart Car, getting even closer to one group of turbines. Because they’re so sleek, it’s hard to grasp their enormous size. Among the half a dozen or so turbines we could easily see at one point, one was right next to the road; we got out so I could photograph her standing next to it, to show scale. That involved a bit of walking around for me, to get far enough away to get the turbine from top to bottom, and to try for a nice angle. 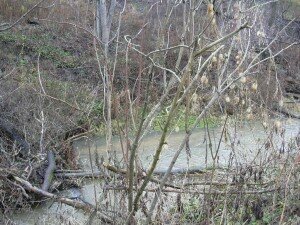 As soon as I was out of the car, I noticed a grating sound – a turbine rotating? Something in need of oil? That was irregular, and extremely unpleasant, in my view. Then, I recognized the rhythmic whooshing, not particularly loud to me, but inexorable. Astounding to me – walking back and forth the few hundred metres to get my photos, I found in some spots I could almost not hear any turbine sound at all, when, only a few steps later, it was very evident. If on one occasion, one person’s perceptions vary so very much, what a challenge it is to obtain information that respects individuals so as to meet the needs and wishes of all. Such a beautiful afternoon, so it was a lovely trip. Seeing so many big, beautiful evergreens surprised me. My favourite sign, spotted past Garnet: Radical Road – an apt theme for our energy policy needs. Lakeshore Road is also aptly named. Today, Lake Erie was a hazy blur of no particular colour, but I’m told on some days, the U.S. is clearly visible. I also learned that it’s a very sharp drop down to the lake; descent on foot is possible, but only if one (goes with someone who) knows how. My supper hostess – yummy cheese-fish chowder 🙂 – spoke right away of the low frequencies Daryl cited in his comment on my previous entry here. 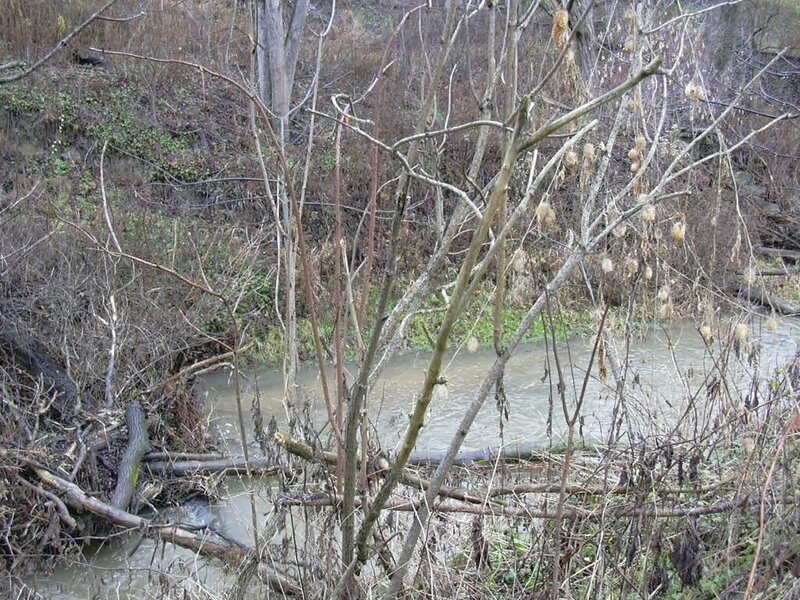 One personal negative experience she noted: this year, for the first time, the pond on her property did not host any bullfrogs. The 18 Vestas 1.65 megawatt turbines in the immediate area got going about 18 months ago, so they didn’t affect the frogs’ development last year. I wonder what info is available about frog populations in other areas where turbines have been installed. I’m now settling in to the home where I’ll be a guest for the week. My hostess says if I’m lucky enough to have the full experience, my bed will shake in the night! Hello, everyone – Next week is Wind Turbine Week for me. I am due to spend the full week of November 22-28 just west of Long Point, staying 24/7 in the home of someone who lives near a large wind farm. Both wind power, and local input into decisions with local impact, are very important to me. I am one of the original members of WindShare, the co-op that installed the wind turbine at the C.N.E. My enthusiasm for wind energy is tempered by my concern that people’s objections to turbine installations must be respectfully addressed. A small group of people who live in the area west of Long Point firmly believe the turbines there are damaging their health. They have requested that someone from outside the community spend a minimum of a week there, full-time. I’ve volunteered. Whether or not I find that the turbines affect me in any way while I am there, I am hoping to explore how the problem of local objections to them can be addressed. 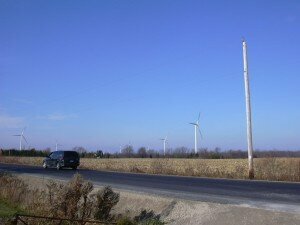 Residents in various areas of Ontario are objecting to wind farm installations. I fear we can’t maximize benefits from this technology without community co-operation.